Summary: Discover the power of a simple gift! Laura Carrot’s Christmas stocking might be empty this year because her dad is in danger of losing his job. While Larry thinks a letter to the North Pole should fix the problem, Bob knows what will really help…and tells the story of a little boy named Nicholas who made a discovery in Bethlehem that changed Christmas forever. But what did Nick learn and how can it possibly help Laura and her family? Find out as the Veggies discover the true joy of giving to others—at Christmas time and throughout the year! For the past few weeks, my kids have been cutting up all of the toy catalogues and making their wish lists. All too often, my family (myself included) gets caught up in planning for Christmas; and sadly, the "real reason for the season" isn't always in the forefront of our minds. 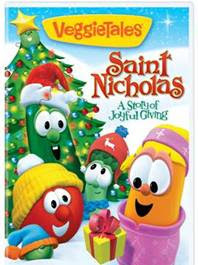 That's why I was so excited to receive a review copy of the new VeggieTales DVD, Saint Nicholas: A Story of Giving. Before my kids and I watched this DVD, I asked them what Christmas meant to them. My 10 year old daughter knew the "correct" answer, but my 5 year old old totally said "Santa Claus." I first cringed and then told him that it was Jesus' birthday and not all about Santa. I suggested that we watch this VeggieTales DVD together and learn about Saint Nicholas and his generosity. My kids recognized their favorite veggies Bob the Tomato (whom my kids swear isn't a vegetable but a fruit) and Larry the Cucumber. And they also "met" a new veggie Nicky the Pepper, the first new VeggieTales character in five years. Nicky stars as Saint Nicholas, the world’s greatest giver, and my kids absolutely loved him! Both Booking Daughter and Booking Son thoroughly enjoyed Saint Nicholas: A Story of Joyful Giving! I did as well. I am a big fan of VeggieTales, and I think these DVDs are a great way to teach youngsters about bible stories and life lessons. I absolutely loved the message in this story about the importance of giving gifts to those less fortunate. In addition, I liked the idea that we don't give gifts to make us happy. Rather we give gifts because we are happy -- we are lucky enough to have been given so much and we can share our happiness through giving. I'm happy to say that when we finished the movie, I asked my son the same question about the meaning of Christmas. This time, he got the "right answer." I have a feeling that we will be watching this DVD more times in the next few weeks. It's a great wake-up call for all of us during this holiday season! The DVD is available for the Suggested Retail Price of $14.93 so it makes a budget-friendly and fun holiday gift. Thanks to Elizabeth from The Morris + King Agency for sending me a review copy of Saint Nicholas! What an easy and fun way to get the meaning of the season across to kids. This sounds like a great way to spend some time with your kids. It's so sad when your kids grow too old for things like this, so you need to enjoy it while you can. This looks cute ... I bet my 5-year-old would enjoy it. my review isn't as kind. I don't celebrate Christmas and just could not get into the religiousness of it but Veggie Tales is well done vs. some of the other kids things (Sponge Bob) I've suffered through of late. I am going to pass it on to a Christian friend who has a young son and I think he'll appreciate it.